If there's one excursion you should do whilst visiting Chiang Mai, it's to spend a day at the Elephant Jungle Sanctuary. It's a once in a lifetime experience, and one that I'm not going to forget anytime soon. The Elephant Jungle Sanctuary is made up of nine locations in Chiang Mai and Phuket, and all provide homes for rescued elephants that were formerly mistreated or tortured. They provide a safe and sustainable environment for visitors to interact with the elephants, whilst most importantly making sure the animals are well looked after. One of the main reasons we decided to visit Chiang Mai was to see elephants for the first time, and the Elephant Jungle Sanctuary ticked all of our boxes. The elephants were safe and loved, and the full day experience was within our budget. I definitely didn't want to put my money into an establishment where riding was part of the itinerary. At the Elephant Jungle Sanctuary, they aim to teach people why elephants shouldn't be ridden or overworked. Before visiting Thailand, I naively thought that in this day and age, people understood that you shouldn't ride elephants for entertainment. How very wrong I was. Unfortunately, throughout my trip to SE Asia, I saw far too many elephants being chained up, ridden, and completely mistreated. I even witnessed elephants chained up to trees on the side of main roads. It was heartbreaking. Elephants aren't supposed to be ridden, as their backs aren't made for carrying weight. They're built very different to horses, and being ridden can cause permanent damage to their spines. There's also a very sad tradition in Thailand where chains, bull hooks, and other instruments are used to train and subdue the elephants for tourism. They're taken away from their mothers at a young age, where they're then tortured into submission. It's known as 'phajaan' - crushing an elephant's spirit. At the Elephant Jungle Sanctuary, all of the staff are so knowledgeable about each of the elephants. It's clear that they love what they do, and truly care for the animals. The day begins with being picked up from your accommodation in Chiang Mai at around 8:30am, where you are then transported to one of the camps. You'll then meet your English-speaking guide, and get to change into traditional Karen clothing, before learning about the history of the elephants. By this point, you're probably itching to catch a glimpse of the animals, and so the guides take you further into the camp for your first experience with the elephants. You get to meet, touch, and feed them. It's an incredible experience. The elephants are free to roam wherever they like, so you may find after the food has run out that they go off and wander further into the forest. At around midday, you get an hour for lunch. There's a Thai buffet lunch, with plenty of bottled water and fresh fruit to go alongside it. After everyone has finished eating, the guides talk more about how the elephants are cared for, before you then get the opportunity to bathe them. This is where it gets really fun! 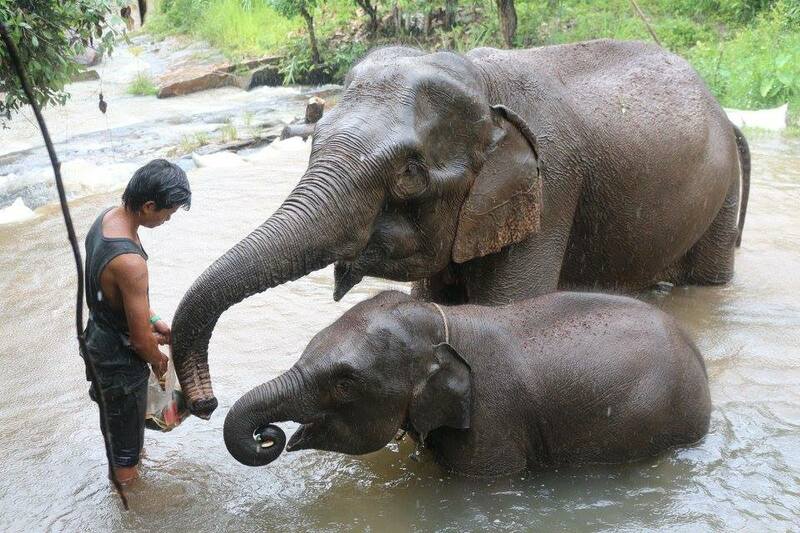 Everyone gets into the river, where you can wash and brush the elephants. You can also give them a mud bath! The day I visited the Elephant Jungle Sanctuary, it was pouring down with rain which really added to the experience. All of the visitors had an amazing time, and the elephants had a blast. At this point the day begins to come to a close. You can change into dry clothes before walking back to the entrance of the camp, where you're then taken back to Chiang Mai for around 6pm. The whole day costs 2,400 Baht per person (£55 / €65 / $70) and is worth every single penny. There are also half day options available that are slightly cheaper at 1,700 Baht. If you're visiting Chiang Mai, I'd recommend booking in advance so you don't risk missing out. It really is an amazing experience! You Might Like: How To Spend 24 Hours In Bangkok, Thailand!